For the past month and a half, I’ve been working as a publicity consultant for the Greenwich Village Society for Historic Preservation. On March 25th, their book Greenwich Village Stories will be released by Rizzoli New York and sold at bookstores nationwide. When I was hired, I was tasked with three main jobs: publicity, book launch events, and social media. Publicity at its core is about connecting the right people. In book publishing, that means connecting your author with the right media outlets. Traditionally, that means newspapers, radio, television, and magazines. Now, with our rapidly evolving industry, the prevalent realm for publicity has moved online. That means blogs, websites for magazines and newspapers, and of course social media platforms like the staples Twitter and Facebook and the increasingly important Tumblr and Pinterest. Social media, a newer concept in publishing (and all forms of marketing), still remains to me somewhat in the world of the abstract. I am of that last generation that can remember the time before I had a computer (I was in the fifth grade when my family purchased its first desktop computer). Now, going online is second nature to us: I receive breaking news through my Twitter feed. I promote my writing through a blog. I stay connected with cross-country friends through Facebook. Now that I work in fields that incorporate social media, there is rarely an hour of my day not spent connected. In marketing/publicity, we become obsessed with re-Tweets, Facebook likes, and the number of subscribers to our blogs. But I don’t think anyone can say with certainty that just because you have a lot of followers of your blog, you’re guaranteed widespread success as an author. Or just because a book’s Facebook page has X amount of likes that will equal the number of books sold. What it really comes down to is online buzz. Every book, movie, album, etc. wants to grab your attention, so they have to find interesting ways to do that. We may not yet be able to quantify the power of social media, but that doesn’t stop us from wanting to create quality content. 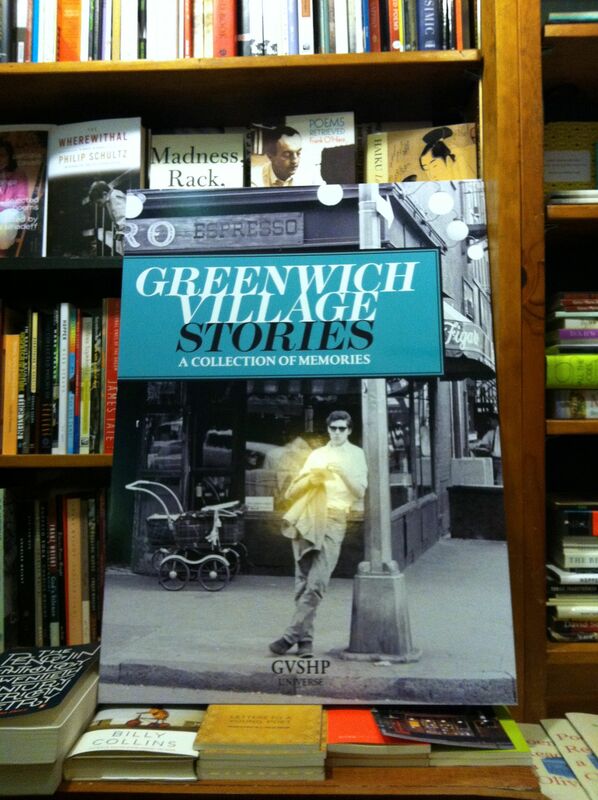 The Greenwich Village Stories poster, soon to be seen in bookstores around the Village. For Greenwich Village Stories, I figured our strengths would be Facebook, Twitter, and GVSHP’s blog Off the Grid. Creating a Facebook page for a book can be difficult because of longevity–once the book comes out, there isn’t as much reason to keep up the page. Most of the content creation needs to happen before the book is released to start getting people interested. Your Facebook page, like any form of social media, needs content in order to thrive. The benefit of a book like Greenwich Village Stories, is that it has over sixty contributors, which means introducing them all is a staggering amount of content of its own to put on our Facebook page. But there can’t just be content, there needs to be engagement. That’s why in a couple of weeks we’re going to launch a contest asking people to share their own Greenwich Village stories and award the winner tickets to one of our exclusive launch events. Because people love free stuff. As far as the blog, there are many things to mine from this book. Last week, I wrote a post about taking a walking tour of the East Village with Greenwich Village Stories as an unofficial guidebook. Whatever a writer/publicist/publishing house chooses to do to promote a book through social media, it should engage and entertain their potential readers. If the social media isn’t interesting, nobody will believe the book is. For any writers out there looking for helping with marketing their books, visit my Author Services page to learn more about how I can help you promote your work.